Huntington Tri-State Airport offers all of the amenities of larger airports, without the stress, long lines and huge crowds. We want to make your visit to HTS as relaxing and enjoyable as possible. The Huntington Tri-State Airport is proud to have Tudor’s Biscuit World and Gino’s Pizzeria & Pub on location. 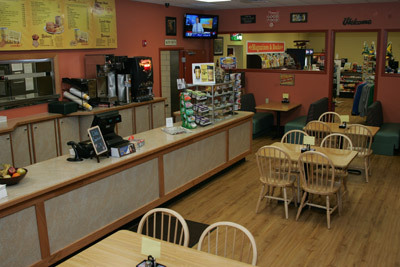 Tudor’s Biscuit World offers a wide variety of breakfast and lunch selections. Breakfast items include made-from-scratch biscuits with your favorite breakfast meats and toppings such as sliced or melted cheese, egg, fried apples and hash browns just to name a few. For those with a more hearty appetite, breakfast platters are also available including the popular biscuits and gravy and Super Breakfast. Tudor’s lunch menu features a large selection of made-to-order sandwiches including pulled pork BBQ, 1/3 pound hamburgers and Tudor’s famous hot dogs. Gino’s Pizzeria & Pub is a relaxing and cozy environment to grab drink or a bite to eat. They offer a full bar with an extensive menu of wine and beer selections. Also served is Gino’s famous pizza, pub style sandwiches, chicken wings and other appetizers. The Tri-State Airport gift shop is the perfect place to grab any last minute travel items, books, magazines, snacks or even a special gift. The shop features many gifts unique to our area and the state of West Virginia such as coal sculptures and hand-blown glass, as well as college team apparel.